CO2 emissions are proportionally linked with the reduction of the fuel consumption of NORDEN's vessels. To reach the target of reducing CO2 emissions from owned vessels by 25% compared to 2007-levels by 2020, exclusive of vessels on contract to third parties, NORDEN focuses on 3 different areas. These are technical improvements, maintenance and voyage efficiency and preserving a young and modern fleet. NORDEN’s Climate Action Plan from 2007 includes 10 fuel saving initiatives, which are assessed yearly for their effectiveness. 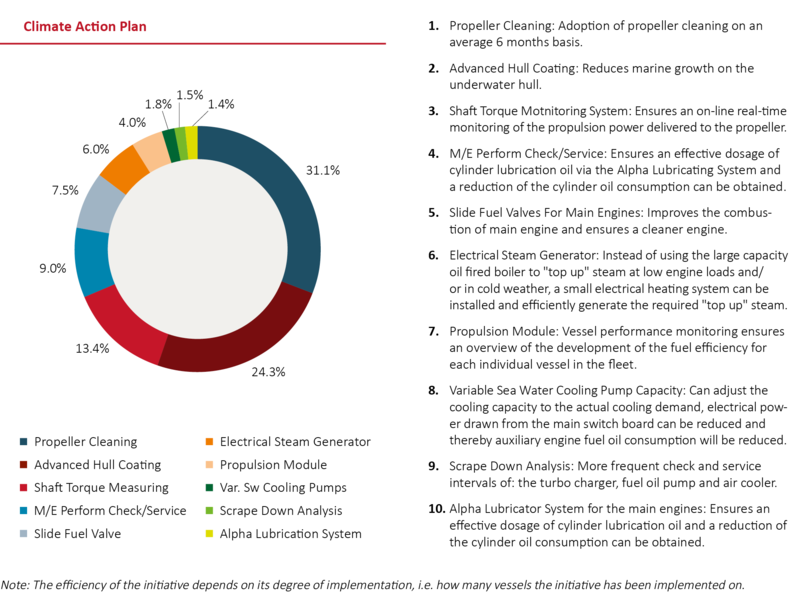 The effect of each initiative is calculated based on assumptions about engine size, engine type, voyage conditions as well as guidelines from the International Maritime Organisation (IMO) and Intertanko. In 2015, the vessel performance monitoring system CASPER was phased out. It was replaced by an improved system, the Propulsion Module, developed internally by our Fuel Efficiency Team. In 2015, the target was to reduce CO2 emissions from owned vessels by 4.7% via the initiatives in the Climate Action Plan, which NORDEN reached with a total reduction of 10.7%. The pie chart illustrates how large a share of the CO2 reduction each initiative contributed with in proportion to the overall reduction of CO2 emissions of 10.7%. 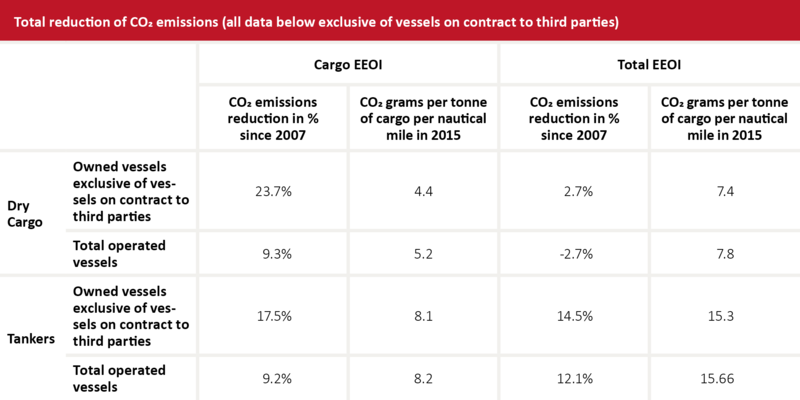 The reduction of 10.7% is included in the total data on reduction of CO2 emissions from owned vessels described below in the subsection Total reduction of CO2 emissions. Despite the decrease in fuel prices, NORDEN continues to focus on fuel efficiency as fuel still accounts for a significant proportion of total voyage costs. In addition, as previously mentioned, fuel consumption is directly linked to CO2 emissions, so the more NORDEN can reduce fuel consumption the more CO2 emissions are decreased. NORDEN’s Fuel Efficiency Team comprises of qualified engineers who cooperate closely with other departments, such as technical, chartering and operations to ensure optimal performance of NORDEN's vessels. They focus on different elements such as monitoring, maintenance and speed optimisation. By monitoring each vessel’s bunker consumption closely, the team can in collaboration with NORDEN’s other departments identify potential possibilities of improvement. They can also react quickly when discovering fouling, as fouling can slow down a vessel considerably and thereby increase its fuel consumption. When fouling is discovered, focus turns to cleaning, such as for instance propeller polish. In addition, the team also focuses on speed optimisation. They make use of the concept of right steaming, which is sailing at the optimal speed according to the framework set out, i.e. time versus cost. It is a practice that optimises our voyages on both owned vessels and chartered vessels. To ensure that operators and other relevant parties quickly react to a vessel’s poor performance, the Fuel Efficiency Team has developed a new system called the Fuel Efficiency Traffic Light. The system follows a vessel’s performance within defined categories and shares actions and plans. Emphasis is on knowledge sharing and ownership of actions and plans, so all involved parties have a visual overview of next steps. NORDEN owns a modern fuel efficient fleet and has in recent years invested heavily in fuel efficient vessels. This is supplemented by continuously evaluating how existing vessels can be optimised. NORDEN's definition of eco vessels is vessels that live up to the phase 2 requirements of the IMO’s Energy Efficiency Design Index (EEDI), which are to be implemented in the shipping industry by 2020. Phase 2 sets the requirements for vessels built in 2020 and onwards and is the stricter version of the current EEDI requirements. NORDEN strives to adhere to these criteria in all future newbuilding contracts. In 2015, NORDEN took delivery of 4 eco tanker vessels and 1 eco dry cargo vessel. Within the next 4 years, NORDEN will take delivery of a total of 8 owned eco dry cargo vessels, 6 long term chartered eco tanker vessels with purchase options, 1 long term chartered eco tanker vessel and 5 eco long term chartered dry cargo vessels with purchase options. NORDEN is once again disclosing Cargo EEOI performance results in addition to the Total EEOI performance, as Cargo EEOI is the indicator that can be directly affected through the quality and operation of the vessel. Therefore it is the best measure of NORDEN's efforts to decrease CO2 emissions. Ballast and Port EEOI are linked to market conditions, including cargo availability, waiting time or port stays, which are generally beyond NORDEN's control. By using the IMO Energy Efficiency Operational Indicator (EEOI), NORDEN is able to see how far we have come in reaching the 25% reduction in CO2 emissions from the 2007 level by 2020. The EEOI is used to calculate the mass of CO2 emitted per metric ton of cargo transported per nautical mile sailed. It is a useful indicator as it enables us to compare our yearly CO2 reduction regardless of changes in fleet size. The results are visually illustrated in the table “Total reduction of CO2 emissions”. Due to the large drop in fuel prices, average speeds have gone up over the entire fleet as a result of the use of right steaming. As fuel consumption depends strongly on the speed, the EEOI is expected to increase when speeds increase. 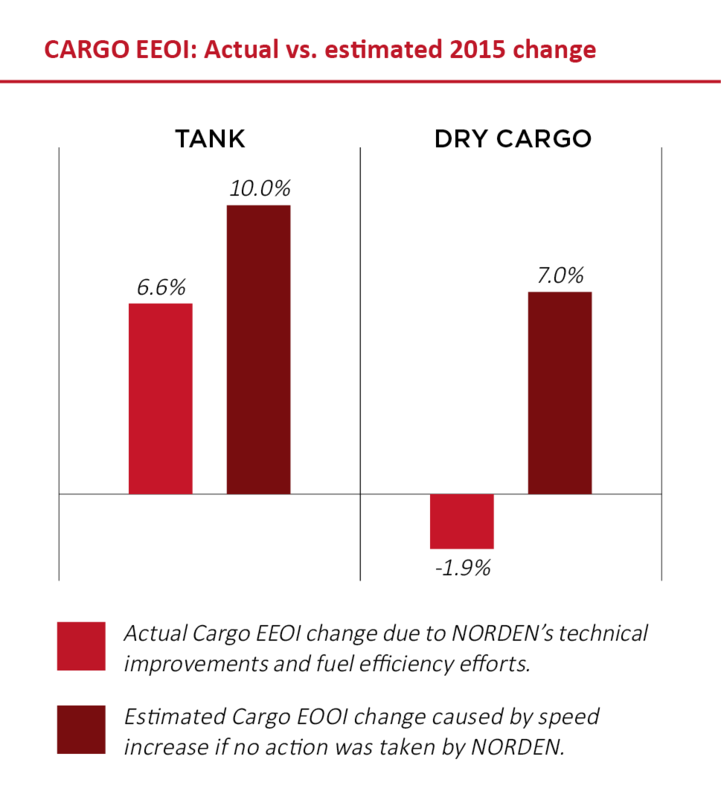 Ballast-laden ratio and port time have continued to be at a high level, however Total EEOI has slightly decreased in 2015 compared to the previous year due to among other things NORDEN’s fuel efficiency efforts. If the efficiency of the dry cargo fleet had been unchanged, the observed increase in speed would have resulted in Cargo EEOI increasing by 7%. However, when looking at all NORDEN’s voyages performed in the dry cargo fleet, Cargo EEOI has improved by 1.9% in 2015. This means that the efficiency of the chartered fleet has improved significantly. For the tanker fleet, the increased speed would result in an increase of Cargo EEOI of more than 10%. However, due to efficiency improvements, we observe that Cargo EEOI has increased by 7.9% for the operated fleet in 2015. A complete outline of NORDEN's CO2 emissions and overall environmental performance can be found in the section Facts, Figures and Assurance.